I was recently asked for my thoughts about constructing a Skaven list for 8th Edition and so over the next few days I'll run a series of posts which outline my thinking. First, some history. At the outset of 7th Edition the Skaven S.A.D. (Skaven Army of Doom) build was one of the strongest in the game. It was based on a combination of magic and Skyre weaponry that had it alternatively billed as "the Gas & Electric Company". Typical features were 2-3 Warlock Engineers, Jezzails, Warp Lightning Cannon etc. The main aim was to blast your opponent off the battlefield. This army did really well at no-Comp events like the UKGT but was hated by all its opponents. In the Australasian environment anything that bore a passing resemblance to S.A.D. was hit very hard with the comphammer. But then things started to change. The big three arrived on the scene and Skaven armies became a very rare sight. Last year I played at the 100 person Orktoberfest in Brisbane and I was one of two people using a Skaven army. 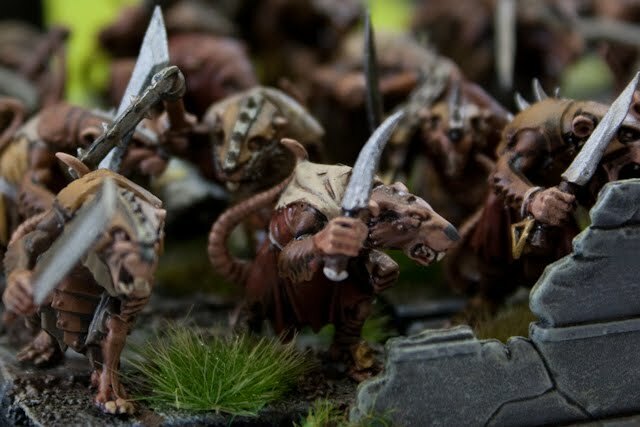 The Skaven army appeared to lose popularity because, in addition to being a huge hobby commitment, it lacked a lot of special rules popular in the more recent armies that gave more certainty to the tournament player e.g. ITP, Hatred, ASF, Fear Causing. Fast forward to November 2009, and a brand new era was delivered to the followers of the Horned Rat by Jeremy Vetock. Jeremy produced an army book that was both characterful and contained choices that allowed the Skaven army to compete with the tough armies. I don't think it had the consistency to be placed on the same tier as Daemons, Dark Elves or (my #3) Lizardmen - others say Vamps - but on its day and given a fair run of dice it could beat any of them. The builds that emerged were based around the unbreakable Plague Furanace, multiple units of crazed Plague Censer Bearers, Warplightning and the Doomwheel. The Doomwheel in particular (due to some charitable FAQs) gave the Skaven army a tool that could deal with the big monsters that Skaven feared. Clanrats were relegated to character bunkers in the main. The army did very well for good players and those who practised a lot. At DogCon, three Skaven armies finished in the Top 10 out of a field of over 150. List construction really became about competition for the Special, and to a lesser extent, Rare slots. It quickly became apparent that the best mix, in the Australasian environment at least, was a unit of Plague Furnace pushing Monks, two units of PCBs, a unit of Poison Sling-wielding Gutter Runners, a Doomwheel and a WLC. Lists quickly became very similar. So that's the history lesson. Next post I'll talk about some of the changes in 8th and how I see them affecting my choices. Interesting. I love skaven but don't have plague bearer models yet. Need to get some on my side it seems. unfortunately PCBs aren't "all that" this edition primarily due to the "step up" rule in conjunction with a low initiative and no saves and being one wound means there likely to get slaughtered. Also from what i can gather the cheesiest list atm features Greyseer/bsb/spamming slaves/gutter runners/x2 WLC and x2 Abombs and probably a furnace as well although its really vulnerable to artillery which is why the storm banner is often taken in these lists.